Venice is generally supposed to be just about the most romantic city on earth. And it's true, it really is. Even those who hate cliches can't deny the romance of this unique and captivating place. But if you arrive in the height of the tourist season, with gawping crowds blocking your every move and noisy school parties shouting above the din of their mobile phone ringtones, you may wonder why on earth you came here to declare love, propose marriage or enjoy your honeymoon. So my advice is to plan ahead, pack a map, and set off to escape the crowds. Away from the tourist sights and main thoroughfares, you will find plenty of quiet and picturesque canalsides and lanes to wander hand-in-hand. On this page I'll suggest some romantic places and things to do to make your holiday or honeymoon truly special and memorable. Further suggestions for romantic things to do and attractive walk itineraries for romantic rambling can be found in the Italy Heaven Guide to Venice. Spend some time comparing and considering hotels. Do you want to be in the heart of the San Marco area, crowded with tourists but convenient for sightseeing? Or would you prefer to be off the beaten track in a small hotel? Would your partner - or bride - or groom - prefer a fashionable design hotel, or a sumptously traditional palazzo? If you mention in the online booking form that it is your honeymoon, you may find your hotel will provide special attentions such as a bottle of wine in your bedroom. However, there is no compulsion for them to do this (remarkably, some honeymooners write embittered hotel reviews if they don't get privileges). If you feel it is important to find your room decked with flowers or wine, I'd suggest you telephone or email the hotel in advance and offer to pay. Choose local sparkling Prosecco, not Champagne. Or - to make the effort into a more personal romantic gesture - why not sneak out during your honeymoon/holiday to surprise your love by filling your room with chocolates, wine and flowers? If you want to buy treats for your love while you're in Venice, you can find flowers at the morning Rialto markets, Prosecco all around town (one great wine shop, with back rooms lined with bottles, is the Drogheria Mascari, near the Rialto markets on Ruga dei Speziali), and for posh chocolates the best shop is VizioVirtù in San Polo (see our links panel for websites). OK, gondola rides aren't cheap, but they're not as cripplingly expensive as you may think - around €80 for 40 minutes. And just think of having to confess to folks back home that you didn't share a gondola trip with your loved one. We wouldn't advise paying extra for musicians as those we've heard are pretty shoddy. Firstly, choose a gondola rank in an area that appeals to you (you won't be able to travel all around Venice in a typical 40-minute journey). Leave this towards the end of your holiday; you'll have a better idea of where you'll want to go, and it'll be a treat to look forward to. In the same way, pick an appropriate time of day. You'll soon decide whether a night-time trip will be too cold or absolutely perfect. Choosing a quiet time of day may help you to avoid 'gondola jams' in busy little canals. Next, establish the price (consult the official published fares in booklets provided in the tourist information offices). Thirdly, discuss with your gondolier where you want to go - along the Grand Canal, navigating quiet little canals (rii) or whatever suits you best. Gondoliers are used to tourists assailing them with questions; and equally used to couples in a world of their own, so - either way - don't be shy. But do be prepared to be photographed by at least one tourist from every bridge you pass under. Consider equipping yourself with a bottle of wine and glasses (be polite and check this is ok with your gondolier). > A hip weekend in Venice - our page of suggestions for a stylish weekend in Venice will also be useful for planning a honeymoon or romantic weekend. Ideas include taking a helicopter ride over Venice, or a sailing trip in a local lagoon boat (perhaps a private evening cruise with wine and music). Apart from a few hotspots, Venice gets very quiet at night, so if you're shy about making a public declaration, wait until nine o'clock or later. Many lanes and canals will be completely deserted (make a reconnaissance trip to check the level of lighting if you have a particular spot in mind; some monuments and churches are beautifully illuminated; others are hard to make out in the gloom). Even the busier places - the Accademia Bridge, for example - should be more manageable by nightfall. And if you wait later - until, say, midnight - you might even find St. Mark's Square almost empty and atmospheric. 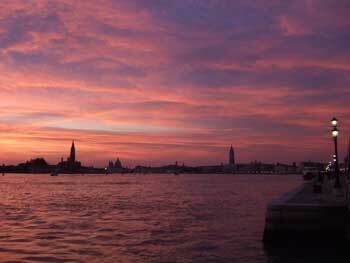 After the golden glow of late afternoon, Venice at sunset can be a marvel of pink-streaked skies. If you get the timing right, there are beautiful sunsets visible from the lagoon shore at the Giardini Pubblici in Castello (vaporetto stop Giardini) or from the park at Sant'Elena, further along the shore. A hot pink sky behind the famous skyline of Venice makes a lovely backdrop for a special moment. There are more good views of the sunset sky from both sides of the Giudecca Canal: from the Zattere shore in Dorsoduro and from the Giudecca island waterfront (including the Hilton Hotel - see below). The drawback is that from these two viewpoints the sun sets behind the industrial skyline of Marghera, which is atmospheric but only in a post-apocalyptic way. Apparently Greg Wise proposed to Emma Thompson on the Accademia Bridge. This wooden bridge over the Grand Canal can be busy (don't hope for quiet in the daytime), but it does offer some of the best and grandest views in Venice, along the Grand Canal to the Salute. For a romantic atmosphere, it's certainly a cut above the Rialto, with its tourist shops and constant queues of photo-snapping visitors. The little waterfront square in front of the church on the island of San Giorgio Maggiore has splendid views over the lagoon towards St. Mark's, the Palazzo Ducale and the mouth of the Grand Canal. There are usually a few tourists and photographers, but it's not too busy, and there are some good excuses for taking your partner there - explain that you want to take photographs of the view, visit the art in the church, admire the view from the campanile, look at the yachts in the little marina ... and then surprise him or her with your grand romantic moment. The church closes at lunchtime. 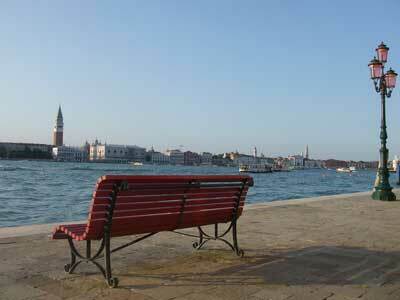 The Giudecca island is peaceful, different, and has lovely views over the lagoon to the main part of Venice. There are some good benches at the end outside the expensive hotels (Zitelle vaporetto stop) which are almost always unoccupied and look across to the Ducal Palace and St. Mark's Square. This is a great, quiet spot for some moments of togetherness. Back past the boat stop is a restaurant (see below) with a few tables outside on the waterfront. For a more cosmopolitan romantic moment, try the rooftop Skyline Bar of the Hilton Molino Stucky Hotel at the far end of the island, towards sunset. For a pleasant stroll, try visiting the Zattere. This long promenade runs along Venice's southern shore. For most of its length it's lively with locals enjoying the sunshine, cafes and restaurants. But towards the tip of the Dogana in the east the businesses peter out, and you'll find yourself walking along a peaceful stretch of path alongside old warehouses with views towards the Giudecca. Restaurants in Italy are usually quite crowded and you may find strangers seated very close to you (sometimes even sharing a bench or table). 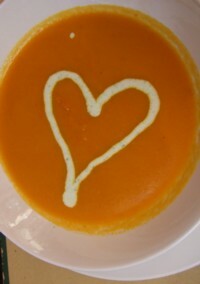 So a meal out may not always be the intimate romantic dinner for which you're hoping. However, most of the places recommended on our restaurants page have a fair amount of space, and many have outside tables in summer. It is always a good idea to book ahead, especially at the weekend. For a really romantic outdoors setting, try Linea d'Ombra on the Zattere waterfront in Dorsoduro (expensive but the terrace above the water is very picturesque) or I Figli delle Stelle on the Giudecca island, with views over the water to St. Mark's - book an outdoors table at sunset for a truly special experience (details on our hip weekend page). The most romantic restaurant of all, though, will not be anyone else's recommendation - it will be the small restaurant which you discover together by chance after wandering down quiet lanes and canals, and which will always be 'your' restaurant. I wouldn't recommend coming to Venice looking for love. 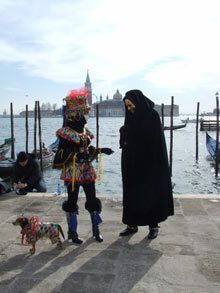 Venice isn't a typical town with a respectable social scene. There are few opportunities to mingle and the only lively bars are frequented mostly by groups of hard-drinking students, tourist couples, and the odd misfit or would-be Casanova. Stick to the romance of the place rather than its inhabitants. Frankly, it's a better place to come to with a lover than to find one.